The two novellas share a world, one roughly cognate to earth, and the stories take place in and around the equivalent of the Mediterranean. In Wilson’s world, the greatest wealth and power are to be found in the city of Olorum. Reading A Taste of Honey, I thought Olorum would be a Maghreb city, on the southern shores of the sea; from the geography in Wildeeps, I thought it south of the parallel Sahara, for Wildeeps is a story that takes place in a caravan in and around its visit to an oasis city known as the Station at the Mother of Waters. The leading characters are all members of the guards who have protected the caravan so far, and will do so again after the break at the Mother of Waters, as the train of people and camels crosses the magical and monster-infested Wildeeps to get to the fabled wealth of Olorum. Some of the guards are old, and some are young, some are veterans of many trips, some have left home for their very first adventure. They all follow their Captain, whose preternatural speed and endurance are just a few of the hints that he is far more than he seems. 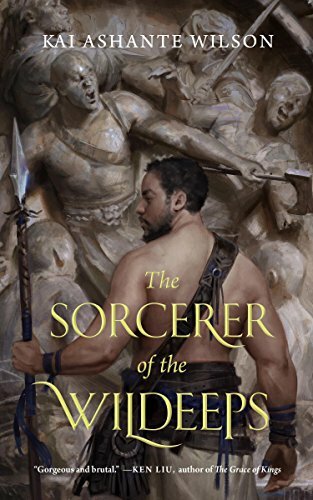 The Sorcerer, one of those making his first journey across the deserts and the Wildeeps, tries to pretend that he is not much more than he seems — he would not have his nickname if he hadn’t already shown some supernatural ability — but does not convince the others. Over the course of the novella, Wilson gradually shows more and more of the Captain and the Sorcerer. He sketches the other guardsmen (they are all men, as far as is known), giving them vivid personalities and hinting about all the different places they have come from to take on this risky journey. Seeing the camaraderie within the company, mixed with rivalry and the knuckleheadedness of some young men, is one of the pleasures of this story. Another is perceiving how Wilson’s world works, based on the glimpses this tale shows. Socerer of the Wildeeps is a story in the world, not of the world; that is, its characters do not shape the world with their actions. Their stories are important to a reader because Wilson has drawn convincing human beings, and what happens to them matters, and that is more than enough to carry the weight of the story. I think that A Taste of Honey is a better work, but I also think that Wilson could not have written it without having first written Wildeeps. They both show fascinating parts of a rich setting, and Wilson populates them with people who feel real, whose heroism and stoicism are moving, whose follies are exasperating, and whose ultimate fates have stayed with me long after I finished the novella.